Clickbait is one of the most popular delivery methods for news. It’s become so popular in recent times that even large news corporations like CNN have resorted to click bait. This popularity has come around because clickbait works, but what makes it work? If you’ve used Facebook in the last few years then you’ll notice that an increasing number of videos and news articles may have been shared by your friends. These usually come from websites like Buzzfeed which have made clickbait popular – but despite common belief, they didn’t actually invent clickbait. Clickbait can be traced back to the 19th century. 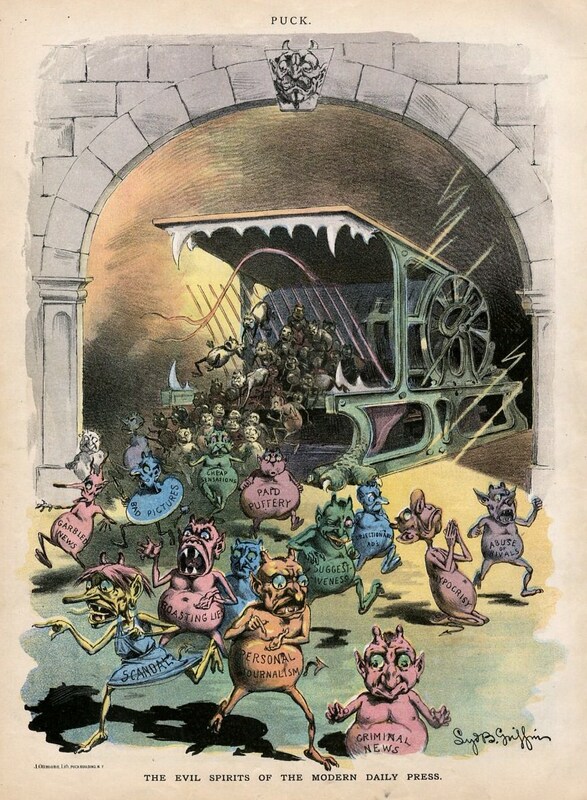 An early form of clickbait would be the 1888 political cartoon ‘The Evil Spirits of the Modern Day Press’ which contains lots of evil spirits each labelled with something that could be likened to modern day complaints regarding journalism. It’s regularly argued that clickbait is so popular because of the internet but this is actually incorrect – clickbait was around before the internet even existed. Clickbait works because of psychology. Reading is an extremely complicated skill that you are extremely fortunate to be able to learn. There have been many studies on reading and it’s an important way for our brains to process information from paper (or screens) into knowledge. Clickbait works because it takes advantage of this process by hijacking the thought process and using an emotion which causes you (the reader) to click the link. One of the pitfalls of this is that clickbait rarely delivers on the hype it created which causes the reader to feel dissatisfied or angry at the writer, although this is another topic altogether. There is a thing in marketing known as the curiosity gap and it’s the main reason as to why clickbait works. It’s so powerful that using it can lead to over a 900% increase in clicks. So what is the curiosity gap? Well, it’s described as the space between what we already know and what we want to know. Simply put a successful clickbait title will trigger curiosity in the reader causing them to click. 23 Things Parents should Never Apologise For. I left my husband & daughter home alone and this happened, I can’t believe it! All of these titles promise a reward to the reader and yet all three of them failed to deliver. The last clickbait headline is an interesting one because it uses an important keyword: ‘science’. This adds credibility to their claim because science has definitely never made a mistake. Oh and in case you were wondering the two basic traits are kindness and generosity. Treating your spouse with respect and sharing can lead to a long and happy relationship: what a surprise. Humans desire things. Whether its fame, fortune, love or even happiness everyone desires something. Clickbait takes advantage of this by promising us something and we click on it. We love a payoff and when a headline promises to ‘change your life forever’ who could possibly say no? Unfortunately, the real payoff is from the advertising revenue generated by websites like Buzzfeed which employ this tactic to take advantage of our quest for knowledge and funny cat images. I can’t believe what this cat has done! When we eventually reach the bottom of the article (which has a very low word count anyway and is bulked out by images) we realise that the promised payoff was either massively over hyped or completely missing and the title was a false promise. The ’12 easy ways to save money to become a millionaire’ should have actually been titled ‘things you probably already do’ but of course, you wouldn’t have clicked on that. …Anger. We’ve all been there. Browsing the internet when all of a sudden you stop scrolling because something caught your eye. You read the headline multiple times and your blood starts to boil and your hand starts to shake. You click the article to find that the article title was actually massively overhyped and the reality of the situation isn’t as bad as it first seemed. You’ve just been clickbaited. No one likes to feel angry but interestingly we are more likely to click an article if the headline makes us mad. Here’s an example of a clickbait headline which works because it makes the users angry. You’ve just spent all that money on a new phone and they’ve undersold you? How dare they! Before you can even put your phone down you already read the article to find out that actually this problem only effects the U.S.A. and even their model is still far superior to other phones on the market. This clickbait method also works with shock. It’s common for clickbait headlines to use shock and awe to get users to click. Here’s an example which uses the shock of death to get users to read their article. We love to be proven right. There are even studies on it. One of the main reasons as to why clickbait works is because it takes advantage. When a headline sides with your opinion (no matter how outrageous) you’re more likely to click it. What does the article actually say? Nothing about saving you money! They knew that their headline would make you feel like debt wasn’t as bad as you thought and you fell for it. It’s no wonder we’ve grown to absolutely hate clickbait. People love nothing more than gossip. It just so happens that gossip involving the president of the United States is a lot more interesting than office gossip, and this love for gossip has given rise to hundreds of global news networks on the internet. All of these news networks are competing for the same thing – your click. 14-year-old girl stabbed her little sister 40 times, police say. The reason why will shock you. Thankfully there’s an awesome twitter account which saves you from falling for the news outlets clickbait. As we previously discussed with the curiosity gap, humans like knowledge. The problem is that we are quite lazy. This means that we don’t actually want to read through piles of information to learn a few quick facts. Fortunately for us there’s a solution: the list. Clickbait works by taking advantage of this. Lists are used for all kinds of things but one of their best uses is to condense large paragraphs of information into simple bite-size chunks. If I told you to learn 10 facts about the Roman Empire by reading a book this would seem like a tedious and long winded task. That’s why you’d probably find a list instead. The psychology behind this is pretty simple. We get our payoff and sense of achievement by reading the list and the workload was reduced. Lists can be further improved by adding pictures. It’s a lot easier to view 20 images of the most beautiful places on Earth than to simply read the names. Unfortunately it’s common for clickbait to promise us 20 hilarious images to brighten up our day only to deliver 3 funny images with 17 fillers. Take this image for example which was in the list of the 20 funniest images on the entire internet. I guess it really didn’t stand much chance to living up to such a title. Despite what edgy kids will tell you, Humans like to belong to groups. Clickbait works by finding unique groups of people it can take advantage of. Were you born in 1990-99? You’re a 90s kid! How many articles have you seen titled “10 things only X will understand”? Clickbait works by throwing the most generic clichés about these groups they could find at you to make you feel like someone understands you. For that special moment you feel unique. Only you and the other people that belong in this group will understand this post. This post was written for you and it makes you feel special. The problem is – the post is usually so generic that almost everyone would understand it. Once again clickbait has used desire to make us feel like we belong. We’ve established that clickbait uses human emotion to get its readers to click for a ‘quick payoff’. The problem with clickbait is that it rarely delivers on the promise. If an article is titled “You won’t believe what happens next” then I can guarantee you that you’ll totally believe it. Is clickbait the future of journalism? In an industry which taps phones and consistently lies I don’t think clickbait is the biggest problem we currently face. 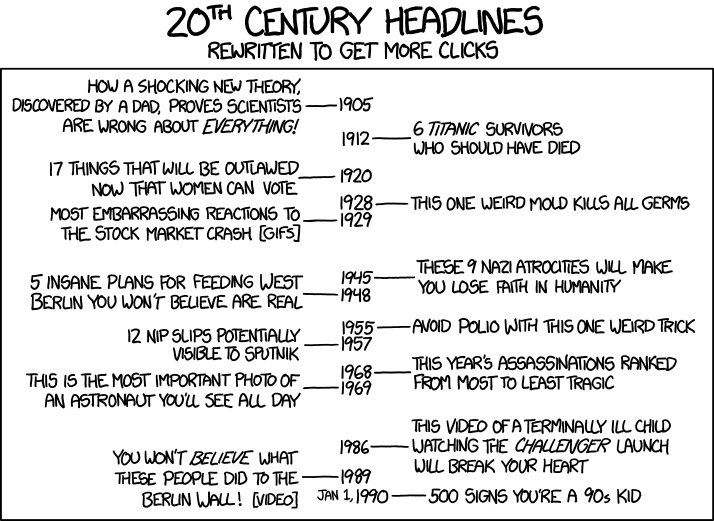 Clickbait has been around for over a century and it’s most likely here to stay. It’s a dishonest and detrimental tactic but it works. As long as advertisers reward traffic to websites it will continue to be used as a primary method to get clicks. If you want to improve your clickthrough rate and conversions then there are much better ways than clickbait. Check out 70 awesome ways to boost your conversions below.